Our customers have given this title an average rating of 4 out of 5 from 4 review(s), add your own review for this title. This is a compelling reading which I recommend highly for anyone who works in the health economy whether as a clinician, manager or commissioner. Although written by a child psychiatrist, and the examples are from that specialty, the general themes discussed are widely relevant for any aspect of health care planning or delivery. Dr West's writing is a symphony of serious thought provoking material beautifully laced with humour. Even a serious-minded clinical academic like me could not help but chuckle several times as I read the book (chuckled loud enough to be noticed by my wife and on another occasion by a stranger who was sitting next to me on a flight). Among other themes, Dr West provides an interesting counterpoise to Evidence Based Medicine (EBM). His caution against the near evangelical adherence to EBM places him in good company because Sir Bradford Hill who is considered one of the fathers of EBM had also warned that 'belief that the controlled trial is the only way would mean not only that the pendulum had swung too far but that it had come right off its hook'. Dr West acknowledges a role for EBM but is also clear that there should be room for alternative paradigms. I share this view to a varying degree but one of the dilemma (as Dr West acknowledges) is how to square this desire to infuse other more subjective paradigms in the context of ever diminishing resources where commissioners have to effectively ration services in a way that is transparent and more accountable to tax payers. This process usually requires some form of data and logic in a way that is arguably easier to do with EBM. This reminds me of the comment by a famous American Engineer, Edwards Deming "In God I Trust; all others must bring data". Another dilemma also partly acknowledged by Dr West is that mental ill-health can be nebulous which means that in the absence of EBM, there could be as many opinions as clinicians. Many of such opinions may have some validity but some may not - even if genuinely held in good faith. This reminds me of another saying by Edwards Deming, "Without data, we are just another person with an opinion". This view is reflected in the way the Law of Medical Negligence has evolved. It was initially held by the Courts that a clinician would not be negligent if his opinion is shared by a body of his peers (Bolam v Friern Hospital Management Committee  1 WLR 582). The phrase "shared by a body of his peers" instead of "the body of his peers" is an acknowledgement by the Courts that there could be different bodies of opinion neither of which would be negligent. However, the Courts subsequently modified this view (Bolitho v City and Hackney Health Authority  4 All ER 771) by adding that in addition to the medical opinion being supported by a body of peers, it also has to be able to 'withstand logical analysis'. It could be argued that EBM (e.g. NICE Guideline) is a paradigm that is more likely to assure a clinician (or commissioner) that their practice has met both the criteria for 'opinion held by a body of peers' and 'able to withstand logical analysis' So, while I share Dr West's welcome critique of EBM and share some of his concerns, in the real life context of diminishing health resources and increasing medical litigation, I also agree with Fiona Godlee (Editor in Chief of the BMJ) when she says that "EBM is flawed but still the best we've got". I recommend this book highly whether for the reader interested in the serious issues explored by Dr West or his humour or both. The author works in child and adolescent mental health, and the book is based on his work and aimed at other professionals working in healthcare. But it's a lot more than that. I don't work in healthcare, but I found the book interesting, thought provoking, and at times inspiring. One of its themes is the struggle of trained, skilled, experienced professionals to do their jobs properly while being managed by bureaucrats within rules made by politicians. That chimed with my experience, and I think anyone in a people-facing job in and beyond the public sector would hear echoes and be cheered by the author's passion. Best of all would be for the bureaucrats and politicians to read the book, think deeply about its message, and resolve to listen with humility to people using their hard-won skills and experience to do a difficult and important job to the best of their ability. The book is beautifully written, making exemplary use of case studies and analogies and metaphors to get ideas across. The author's honesty, love of his work, and sense of humour shine through. 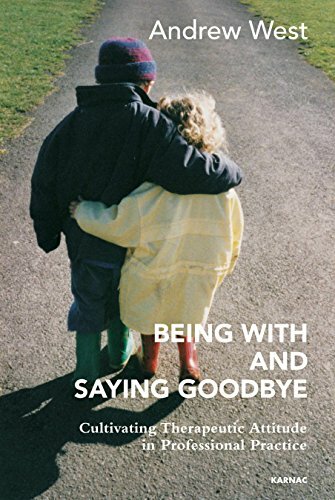 It is rare, in a professional book, to find that the voice of the author emerges quite so strongly and authentically as it does in Andrew West's Being With and Saying Goodbye. This seems entirely appropriate as the book is an attempt to explore how clinicians may set about "being wit" their clients or patients in ways that honour the individuality of each patient and allow the clinician to do their work authentically. West argues strongly that there are aspects of contemporary healthcare systems and policies which actively undermine the potential for professionals to "be with" their patients. He identifies key aspects of the therapeutic attitude that he is advocating and gives many vignettes and examples that evidence his own thoughtfulness and integrity as a clinician who cares deeply about his work. While this book is invaluable for psychiatrists, psychologists, psychotherapists and others working in the broad area of mental health, I think that anyone whose work involves helping relationships, with adults as well as children, will find much that is of value. It is expressed in a way that is unstuffy, very human and, at times, passionate. His patients and Services are lucky to have him. I hope that many others will take the time to "be with" him by reading the book. I know nothing about psychiatry, but I found this a gripping read. I like the metaphors, similes and analogies. I like the anecdotes and the mini case histories (nicely breaking up the page) and the summaries. I like the humour and the irony. I like the straight talking, the directness of the language, the minimum of jargon. I like the personal warmth and the sincerity that come through so clearly. I like the ambition of it (attempting to change people's mindsets and approaches) and the writer's clear grasp of what his job entails. Not many people actually understand the complexity of their work at all well. The author is consistently modest and unassuming, nevertheless it is totally clear to the reader that a) he knows what he's talking about, and b) he has an admirable goal in mind in writing this book. I love the way the book builds to the final chapter, which in my view is the best, and is a masterly piece of writing. Perhaps this book isn't for everybody, but surely, the more we all understand about how our minds and emotions work, the better we'll be able to relate to each other and our children.